What to know before you buy natural stone. Granite or limestone, slate or Travertine, colorful or neutral, polished or honed, 12”x12” or 16”x16”, bull nose or 90 degree edge, and on an on. Natural stone flooring offers you virtually endless types, styles and price points. But all that variety and all those decisions can be quite intimidating to the unknowing shopper. With natural stone, knowledge really pays off. And knowledge today, before you buy, can be invaluable. It can help you decide which type of natural stone best fits with your home and its activities, which size tile complements your room size and much more. It’s all about things you should be aware of, keep in mind, and just plain know, before your shopping phase leads to purchase time. You won’t see your floor at the neighbors. The beauty of natural stone is that no two pieces are ever the same. Each piece has its own natural characteristics such as color, veining and markings, as well as hardness and porosity. Your floor is truly unique and completely individual. Exclusive. A natural stone tile floor begins with giant pieces of stone that are mined from the earth and transported to factories where they are cut into thin slabs. Each slab is different, displaying the affects of the physical course of its ancient history. The slabs are then cut into individual tiles. Depending solely on Mother Nature, and Father Time, each tile cut from the same slab might look completely different from the next. Veining and crystallization may be abundant in one, yet non-existent in another. Appearance may vary from tile to tile, but that only adds to the elegance, charm and magic of natural stone. With natural stone you go with the flow. Variations in natural stone are to be expected and, frankly, enjoyed. So the samples you view at our store can have completely different veining patterns or color variations compared to the stone installed in your home. Also, please remember that it is not possible for you to hand select your natural stone. You should be aware that irregular markings, lines, veins and crystallization are not cracks or imperfections, but rather a natural part of the stone’s beauty. Think of them all as forming the “personality” of your floor. Additionally, if you select a combination of natural stone products, of the same color and type of stone, for different areas of your home, they will not match. And no natural stone tile will have a perfectly smooth surface. Even after the tiles are polished there may be small chips or pits that may be apparent in different lighting. 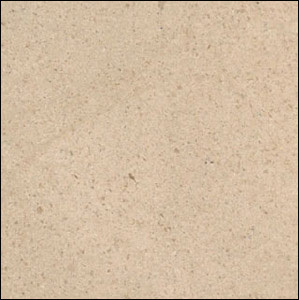 Being a natural product, natural stone tiles will vary more in thickness, squareness and length compared to man-made ceramic tile. As a result, once your natural stone tile is installed, it will not be a perfectly smooth surface from tile to tile. Finally, natural stone also varies in hardness, which is the scratch resistance of a mineral. Talc is the softest mineral and diamond is the hardest. This is important when picking a stone. Make sure to consider what types of activities will be taking place where the stone is installed in your home. For example, you would not want to install a soft, porous type of stone floor in a high traffic area. Our best advice is to consult with us. Hard and fast facts about the popular half dozen. To help you shop smart for natural stone flooring, here’s a rundown on six popular stones: granite, marble, limestone, travertine, slate and tumbled stone. 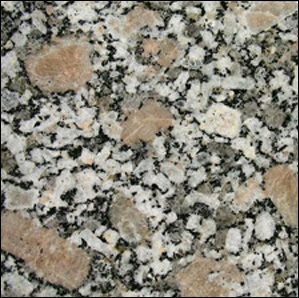 Granite is one of the hardest and densest of all natural stone. In fact, made up of quartz, feldspar and mica, granite is one of the hardest stones next to diamond. It also resists staining and scratching better than any other natural stone due to its density. Granite makes a powerful impact in kitchens, entryways and bathrooms, or as an accent with other natural stone tiles. 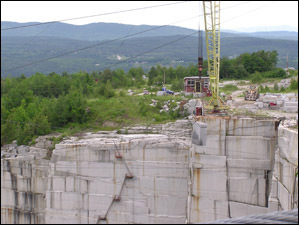 Marble is crystallized limestone that comes in many different color variations and usually displays a veining pattern that adds to its uniqueness. 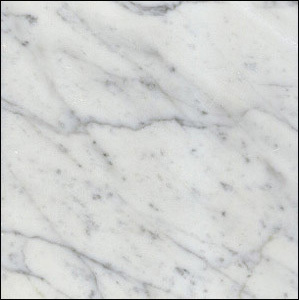 Marble is a timeless addition to any home, bearing the signs and marks of history from thousands of years. Marble is more porous than granite, making it more susceptible to staining and therefore is more suitable for your foyers, bathrooms, fireplaces, studies or libraries. A note to you on marble color. It is important to know that green and black marbles are not recommended for wet areas of the home, such as a shower. Green marbles will absorb water and then curl and warp. 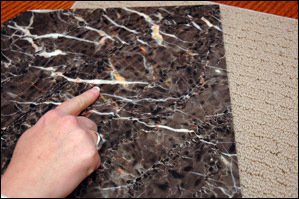 Black marbles, when wet, can exhibit “spalling” at veins, which means small pieces of the stone may break away. 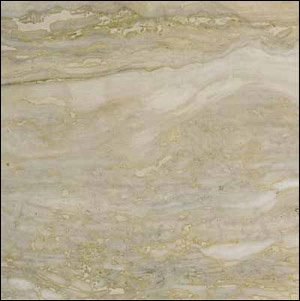 Limestone has a more subtle look and is often offered in a “honed” or matte finish. Limestone is created by the accumulation of organic materials such as shells and coral. This stone will require preventative maintenance over time, as it is very porous. As it is a softer and more porous stone it may not be suitable for all areas in the home because it will stain easily. Travertine is a unique looking stone due to the “fill process”. In its original form, travertine has thousands of holes running through it. These holes are filled and then the stone is polished. The stone polishes to a high sheen and the fill areas remain dull offering you a unique and beautiful floor. However, like limestone, travertine will require you to have preventative maintenance performed over time, due to its porosity. 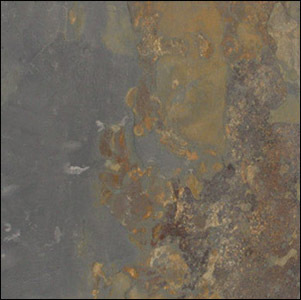 Slate, a rustic-looking stone, has become increasing popular over the years. It comes in various colors and shades in the warm and earthy tones. Slate has some of the most dramatic color variations from tile to tile. Colors range from rich reds, oranges and golds, to mauve, lavender, green, blue, black, rust and brown. Imagine the possibilities in your home! Slate tile is extremely durable and can be used in indoor and outdoor installations. All slate has a natural clefting along the surface that gives this stone its unique textural look of layers. Tumbled Stone has an antique look. These tiles come in numerous sizes and are many times used in borders or decorative strips. Their Old World look is recreated through modern means. Pieces of marble, travertine and limestone are tumbled and distressed to evoke a timeworn look of stone from centuries past. Perhaps this is the look you’re after. 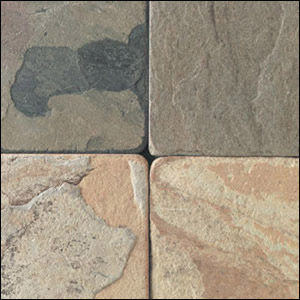 Tumbled Stone is often times created into accent strips, mosaics and smaller sizes such as 4” x 4” and 6” x 6”. This type of stone is a design element that is both rustic and elegant at the same time. Natural stone tile grout lines are typically filled with un-sanded grout and are usually much thinner than ceramic tile installations. Grout can match, contrast or coordinate with your stone tile. Remember that grout will outline each tile creating a visual picture frame. If you want the grout to be less noticeable, select a grout that is close in color to the stone. A contrasting grout color, either darker or lighter, will make the grout lines more visible and thereby will create a checkerboard effect. Grout colors installed in your home can be slightly different from the sample you viewed in our store. This is due to differences in temperature and humidity during installation. Even when the same grout color is used, it is also common to see slight differences between the grout used for floor tile in one room and the grout used in an adjacent room. Exact layouts, type of grout and grout joint widths are determined by the tile setter at the time of installation and are governed by the actual size and shape of the tile, and the exact dimensions of the areas to be covered. It is important to note that sealing of natural stone is highly recommended, and that it be performed by a seasoned professional. Sealing your natural stone flooring makes it less porous, more stain resistant, and protects the stone’s original beauty. There are different types of sealer depending on your type of stone. We recommend consulting with us about sealing your flooring. You should also be aware that, once your flooring is installed, you are responsible for maintaining all caulked areas to guard against water damage. Get on top of the bottom line. Know the entire cost of ownership. The “cost per square foot” of your natural stone floor is just one component of the entire project cost. To ensure there are no surprises, and the natural stone you select fits within your overall project budget, be sure to ask us to calculate the total cost of your floor covering project. Demolition/disposal of old floor covering. Depending on the existing floor covering, this can be an expensive item; also, be sure to include the cost to dispose of the old floor covering. Subfloor preparation. Depending on the condition of the subfloor, it may require additional work. Natural stone installation. Determine the cost per square foot to install it. Materials required to complete the installation. Your new natural stone floor may require additional materials to install it properly. In addition to the total project cost, you should also know the cost of cleanings to maintain the beauty and life of your natural stone floor. We can help you answer those questions. There’s a lot to know and consider before buying your natural stone floor, so take your time, ask questions and learn as much as you need to. One thing you’ll discover is that when it comes to one-of-a-kind beauty, enchanting personality and timeless style, natural stone is in a class by itself. Big Bob’s Flooring Outlet of Muncy PA serves: Muncy, Montoursville, Watsontown, Lock Haven, Williamsport, Hughesville, Canton, Jersey Shore, and Milton. We service the counties of: Sullivan, Lycoming, Montgomery, Clinton, Bradford, Montour, Columbia, Luzerne, Union, and Centre. We carry a fine selection of floors including carpet, hardwood, laminate, ceramic tile, vinyl, LVT and area rugs. Shop-at-Home Flooring & Next Day Installation available. Stocking products available for carpet, hardwood flooring, tile, laminate, vinyl, luxury vinyl tile and rugs. Our in-store & shop at home flooring specialists have been through hours of training to educate our customers, answer tough questions, and provide the best customer service possible. Serving Muncy, Montoursville, Watsontown, Lock Haven, Williamsport, Hughesville, Canton, Jersey Shore, and Milton PA.
© Big Bob’s Flooring Outlet of America, Inc. All Rights Reserved.